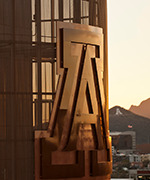 I joined Department of Atmospheric Sciences at the University of Arizona as a faculty member in August 2006. My doctoral and postdoctoral work at the Department of Atmospheric Science at Colorado State University applied a regional atmospheric model to the investigation of North American summer climate. Current research within my group at the University of Arizona focuses principally on physical understanding and prediction of climate in North America through regional atmospheric modeling and analysis of observations. Specific topics being investigated in the scope of our projects include improving seasonal climate forecasts, convective-resolving simulations of severe weather, water resource projection at the regional and local scale, and contributions to parameterization development in the Weather Research and Forecasting model. Our projects engage the operational weather forecast community and water resource providers in the Southwest. Through my collaborations and outreach activities, I am also working to develop improved capacity for weather climate research in other parts of the world, especially Latin America. Castro, C. L., Centeno, R., Adams, D. K., Amador, J., Cavazos, T., López, R., Lizárraga, C., Castro, V., & López, E. (2016). Fenómenos Clímaticos y Su Relevancia Para El Cambio Climático Regional Futuro, Capítulo 12 de Reporte Mexicano de Cambio Climático: Bases Científicas, Modelos, y Modelación, [English Tranlation: Climate phenonmena y their relevance for future regional climate change, Chapter 12 of Mexican Climate Change Report: Scientific bases, models, and modeling] . National Autonomous University of Mexico, Program in Climate Change Research. Mexico City, D.F., Mexico..
Cayan, D. M., Tyree, M., Castro, C. L., Gurshonov, A., Barsugli, J., Ray, A., Anderson, M., Rajagopalan, B., Rangwala, I., & Duffy, P. (2013). Future Climate: Projected Average, Chapter 6. In Assessment of Climate Change in the Southwest United States: A Report Prepared for the National Climate Change Assessment . Gurshonov, A., Overpeck, J., Guirguis, K., Cayan, D., Dettinger, M., Castro, C. L., Schwartz, R. E., Anderson, M., Ray, A., Barsugli, J., Cavazos, T., & Alexander, M. (2013). Future Climate: Projected Extremes, Chapter 7. In Assessment of Climate Change in the Southwest United States: A Report Prepared for the National Climate Change Assessment . Amador, J., Ambrizzi, T., Cavazos, T., Castro, C. L., Cerezo-Mota, R., Fuentes-Franco, R., Giorgi, F., Guiliani, G., Lee, H., Méndez-Pérez, M., & Rivera, E. (2018). Putting into action the REGCM4.6 regional climate model for climate change, variability, and modeling over Central America.. Atmósfera . Carrillo, C. M., Castro, C. L., Garfin, G. M., Chang, H. I., Bukovsky, M. S., & Mearns, L. O. (2018). Pacific sea surface temperature related influences on North American monsoon precipitation within North American Regional Climate Change Assessment Program models. International Journal of Climatology . Carrillo, C. M., Castro, C. L., Garfin, G. M., Chang, H., & Bukovsky, M. S. (2018). Pacific SST-related teleconnective influences on North American monsoon precipitation within North American Regional Climate Change Assessment Program (NARCCAP) models. International Journal of Climatology . Cassell, W. W., Chang, H. I., Nguyen, T. M., Castro, C. L., & Luong, T. M. (2018). Improvement in the Modeled Representation of North American Monsoon Precipitation Using a Modified Kain–Fritsch Convective Parameterization Scheme. Atmosphere . Martinez, J. A., Arias, P., Castro, C. L., Chang, H., & Ochoa-Moya, C. A. (2018). Sea surface temperature‐related response of precipitation in northern South America according to a WRF multi‐decadal simulation. International Journal of Climatology . Moker, J., Castro, C. L., Arellano, A., Serra, Y., & Adams, D. K. (2018). Convective-permitting hindcast simulations during The North American Monsoon GPS Transect Experiment 2013: Establishing Baseline Model Performance Without Data Assimilation. Journal of Applied Meteorology and Climatology . Luong, T. M., Castro, C. L., Chang, H., Lahmers, T., Adams, D. K., & Ochoa-Moya, C. A. (2017). The More Extreme Nature of North American Monsoon Precipitation in the Southwestern United States as Revealed by a Historical Climatology of Simulated Severe Weather Events. JOURNAL OF APPLIED METEOROLOGY AND CLIMATOLOGY , 56(9), 2509-2529. Manuel, M. C., Castro, C. L., Cummins, K. L., Waissmann, J., & Adams, D. K. (2017). An Improved QPE over Complex Terrain Employing Cloud-to-Ground Lightning Occurrences. JOURNAL OF APPLIED METEOROLOGY AND CLIMATOLOGY , 56(9), 2489-2507. Niraula, R., Meixner, T., Dominguez, F., Bhattarai, N., Rodell, M., Ajami, H., Gochis, D., & Castro, C. (2017). How Might Recharge Change Under Projected Climate Change in the Western US?. GEOPHYSICAL RESEARCH LETTERS , 44(20), 10407-10418. Switanek, M. B., Troch, P. A., Castro, C. L., Leuprecht, A., Chang, H., Mukherjee, R., & Demaria, E. (2017). Scaled distribution mapping: a bias correction method that preserves raw climate model projected changes. HYDROLOGY AND EARTH SYSTEM SCIENCES , 21(6), 2649-2666. Castro, C. L., Chang, H., Ding, Q., Arritt, R., & Salathé, E. (2016). Toward a new paradigm of convective-permitting modeling in subseasonal-to-seasonal forecasting of warm season precipitation extremes. US CLIVAR Variations Newsletter , 14(4), 1-7. Fruh, B., Will, A., & Castro, C. L. (2016). Editorial: Recent developments in Regional Climate 1 Modelling with COSMO-CLM, Part 2. METEOROLOGISCHE ZEITSCHRIFT , 25(5), 529-529. Lahmers, T. M., Castro, C. L., Adams, D. K., Serra, Y. L., Brost, J. J., & Luong, T. (2016). Long-Term Changes in the Climatology of Transient Inverted Troughs over the North American Monsoon Region and Their Effects on Precipitation. JOURNAL OF CLIMATE , 29(17), 6037-6064. Mazon, J. J., Castro, C. L., Adams, D. K., Chang, H., Carrillo, C. M., & Brost, J. J. (2016). Objective Climatological Analysis of Extreme Weather Events in Arizona during the North American Monsoon. JOURNAL OF APPLIED METEOROLOGY AND CLIMATOLOGY , 55(11), 2431-2450. Meixner, T., Manning, A. H., Stonestrom, D. A., Allen, D. M., Ajami, H., Blasch, K. W., Brookfield, A. E., Castro, C. L., Clark, J. F., Gochis, D. J., Flints, A. L., Neff, K. L., Niraula, R., Rodell, M., Scanlon, B. R., Singha, K., & Walvoord, M. A. (2016). Implications of projected climate change for groundwater recharge in the western United States. JOURNAL OF HYDROLOGY , 534, 124-138. Serra, Y. L., Adams, D. K., Minjarez-Sosa, C., Moker, J. M., Arellano, A. F., Castro, C. L., Quintanar, A. I., Alatorre, L., Granados, A., Vazquez, G. E., Holub, K., & Demets, C. (2016). THE NORTH AMERICAN MONSOON GPS TRANSECT EXPERIMENT 2013. BULLETIN OF THE AMERICAN METEOROLOGICAL SOCIETY , 97(11), 2103-2115. Carrillo, C. M., Castro, C. L., Woodhouse, C. A., & Griffin, D. (2015). Low frequency variability of the North American monsoon as diagnosed through early and latewood tree-ring chronologies in the Southwest U.S.. International Journal of Climatology . Chang, H., Castro, C. L., Carrillo, C. M., & Dominguez, F. (2015). The more extreme nature of US warm season climate in the recent observational record and two "well-performing" dynamically downscaled CMIP3 models. JOURNAL OF GEOPHYSICAL RESEARCH-ATMOSPHERES , 120(16), 8244-8263. Seastrand, S., Serra, Y., Castro, C., & Ritchie, E. (2015). The dominant synoptic-scale modes of North American monsoon precipitation. INTERNATIONAL JOURNAL OF CLIMATOLOGY , 35(8), 2019-2032. Shamir, E., Megdal, S. B., Carrillo, C., Castro, C. L., Chang, H., Chief, K., Corkhill, F. E., Eden, S., Georgakakos, K. P., Nelson, K. M., & Prietto, J. (2015). Climate change and water resources management in the Upper Santa Cruz River, Arizona (vol 521, pg 18, 2015). JOURNAL OF HYDROLOGY . Shamir, E., Megdal, S. B., Carrillo, C., Castro, C. L., Chang, H., Chief, K., Corkhill, F. E., Eden, S., Georgakakos, K. P., Nelson, K. M., & Prietto, J. (2015). Climate change and water resources management in the Upper Santa Cruz River, Arizona. JOURNAL OF HYDROLOGY , 521, 18-33. Ciancarelli, B., Castro, C. L., Woodhouse, C., Dominguez, F., Chang, H., Carrillo, C., & Griffin, D. (2014). Dominant patterns of US warm season precipitation variability in a fine resolution observational record, with focus on the southwest. INTERNATIONAL JOURNAL OF CLIMATOLOGY , 34(3), 687-707. Rajagopal, S., Dominguez, F., Gupta, H. V., Troch, P. A., & Castro, C. L. (2014). Physical Mechanisms Related to Climate-Induced Drying of Two Semiarid Watersheds in the Southwestern United States. JOURNAL OF HYDROMETEOROLOGY , 15(4), 1404-1418. Rajagopal, S., Dominguez, F., Gupta, H. V., Troch, P. A., & Castro, C. L. (2014). Physical mechanisms related to climate-induced drying of two semi-arid watersheds in the southwest US. Journal of Hydrometeorology , 15. Rivera, E. R., Dominguez, F., & Castro, C. L. (2014). Atmospheric Rivers and Cool Season Extreme Precipitation Events in the Verde River Basin of Arizona. JOURNAL OF HYDROMETEOROLOGY , 15(2), 813-829. Shamir, E., Megdal, S. B., Carillo, C., Castro, C. L., Chang, H., Chief, K., Corkhill, F., Eden, S., Georgakakos, K., Nelson, K., & Prietto, J. (2015). Climate change and water resources management in the Upper Santa Cruz River. Journal of Hydrology , 18. Shamir, E., Megdal, S.B., Carrillo, C., Castro, C., Chang, H., Chief, K., Corkhill, F., Eden, S., Georgakakos, K., Nelson, K., and Prietto, J. (2015). Climate change and water resources management in the Upper Santa Cruz River, Arizona. Journal of Hydrology 521, pp. 18-33. http://dx.doi.org/10.1016/j.jhydrol.2014.11.062. Dominguez, F., Rivera, E., Lettenmaier, D. P., & Castro, C. L. (2013). Changes in winter precipitation extremes for the western United States under a warmer climate as simulated by regional climate models. GEOPHYSICAL RESEARCH LETTERS , 39. Griffin, D., Woodhouse, C. A., Meko, D. M., Stahle, D. W., Faulstich, H. L., Carrillo, C., Touchan, R., Castro, C. L., & Leavitt, S. W. (2013). North American monsoon precipitation reconstructed from tree-ring latewood. GEOPHYSICAL RESEARCH LETTERS , 40(5), 954-958. Abstract: The North American monsoon is a major focus of modern and paleoclimate research, but relatively little is known about interannual- to decadal-scale monsoon moisture variability in the pre-instrumental era. This study draws from a new network of subannual tree-ring latewood width chronologies and presents a 470-year reconstruction of monsoon (June-August) standardized precipitation for southwestern North America. Comparison with an independent reconstruction of cool-season (October-April) standardized precipitation indicates that southwestern decadal droughts of the last five centuries were characterized not only by cool-season precipitation deficits but also by concurrent failure of the summer monsoon. Monsoon drought events identified in the past were more severe and persistent than any of the instrumental era. The relationship between winter and summer precipitation is weak, at best, and not time stable. Years with opposing-sign seasonal precipitation anomalies, as noted by other studies, were anomalously frequent during the mid to late 20th century. © 2013. American Geophysical Union. All Rights Reserved. Woodhouse, C. A., Meko, D. M., Griffin, D., & Castro, C. L. (2013). Tree rings and multiseason drought variability in the lower Rio Grande Basin, USA. WATER RESOURCES RESEARCH , 49(2), 844-850. Bieda, S. W., Castro, C. L., Mullen, S. L., Comrie, A. C., & Pytlak, E. (2012). The Relationship of Transient Upper-Level Troughs to Variability of the North American Monsoon System. JOURNAL OF CLIMATE , 22(15), 4213-4227. Castro, C. L., Chang, H., Dominguez, F., Carrillo, C., Schemm, J., & Juang, H. H. (2012). Can a Regional Climate Model Improve the Ability to Forecast the North American Monsoon?. JOURNAL OF CLIMATE , 25(23), 8212-8237. Abstract: Global climate models are challenged to represent the North American monsoon, in terms of its climatology and interannual variability. To investigate whether a regional atmospheric model can improve warm season forecasts in North America, a retrospective Climate Forecast System (CFS) model reforecast (1982-2000) and the corresponding NCEP-NCAR reanalysis are dynamically downscaled with the Weather Research and Forecasting model (WRF), with similar parameterization options as used for highresolution numerical weather prediction and a new spectral nudging capability. The regional model improves the climatological representation of monsoon precipitation because of its more realistic representation of the diurnal cycle of convection. However, it is challenged to capture organized, propagating convection at a distance from terrain, regardless of the boundary forcing data used. Dynamical downscaling of CFS generally yields modest improvement in surface temperature and precipitation anomaly correlations in those regions where it is already positive in the global model. For the North American monsoon region, WRF adds value to the seasonally forecast temperature only in early summer and does not add value to the seasonally forecast precipitation. CFS has a greater ability to represent the large-scaleatmospheric circulation in early summer because of the influence of Pacific SST forcing. The temperature and precipitation anomaly correlations in both the global and regional model are thus relatively higher in early summer than late summer. As the dominant modes of early warm season precipitation are better represented in the regional model, given reasonable large-scale atmospheric forcing, dynamical downscalingwill add value to warm season seasonal forecasts. CFS performance appears to be inconsistent in this regard. © 2012 American Meteorological Society. Dominguez, F., Rivera, E., Lettenmaier, D. P., & Castro, C. L. (2012). Changes in winter precipitation extremes for the western United States under a warmer climate as simulated by regional climate models. Geophysical Research Letters , 39(5). Abstract: We find a consistent and statistically significant increase in the intensity of future extreme winter precipitation events over the western United States, as simulated by an ensemble of regional climate models (RCMs) driven by IPCC AR4 global climate models (GCMs). All eight simulations analyzed in this work consistently show an increase in the intensity of extreme winter precipitation with the multi-model mean projecting an area-averaged 12.6% increase in 20-year return period and 14.4% increase in 50-year return period daily precipitation. In contrast with extreme precipitation, the multi-model ensemble shows a decrease in mean winter precipitation of approximately 7.5% in the southwestern US, while the interior west shows less statistically robust increases. Copyright 2012 by the American Geophysical Union. Leavitt, S. W., Woodhouse, C. A., Castro, C. L., Wright, W. E., Meko, D. M., Touchan, R., Griffin, D., & Ciancarelli, B. (2012). The North American monsoon in the US Southwest: Potential for investigation with tree-ring carbon isotopes. QUATERNARY INTERNATIONAL , 235, 101-107. Meko, D. M., Touchan, R., Villanueva Diaz, J., Griffin, D., Woodhouse, C. A., Castro, C. L., Carillo, C., & Leavitt, S. W. (2012). Sierra San Pedro Martir, Baja California, cool-season precipitation reconstructed from earlywood width of Abies concolor tree rings. JOURNAL OF GEOPHYSICAL RESEARCH-BIOGEOSCIENCES , 118(4), 1660-1673. Minjarez-Sosa, C. M., Castro, C. L., Cummins, K. L., Krider, E. P., & Waissmann, J. (2012). Toward development of improved QPE in complex terrain using cloud-to-ground lightning data: A case study for the 2005 Monsoon in Southern Arizona. Journal of Hydrometeorology , 13(6), 1855-1873. Abstract: a study area in southwest Arizona and northwest Mexico. Using seasonal-to-daily and hourly time resolution, the National Climatic Data Center (NCDC) stage IV precipitation product and the U.S. National Lightning Detection Network lightning data have been analyzed with the aim of developing an improved understanding of the relationship between these variables. A Gaussian method of spatially smoothing discrete lightning counts is used to estimate convective rainfall and improve the quality and spatial coverage of radar-derived precipitation in areas of complex terrain. For testing the dependence of the relationship betweenCGlightning and precipitation, a precipitation "sensor coverage" analysis has been performed. If locations that have poor sensor coverage are excluded, R2 between lightning and precipitation improves by up to 15%. A complementary way to estimate convective precipitation is proposed based on 1-h lightning occurrence intervals, which is the maximumtime resolution in this study.Wefind that ̃67% of the seasonal 2005 precipitation over the analysis domain is associated with CG lightning. Daily precipitation estimates are improved by specifying a "diurnal day" based on the diurnal maxima and minima in precipitation and CG lightning within the domain. Our method for improving quantitative precipitation estimation (QPE) using lightning is able to track and estimate convective precipitation over regions that have poor sensor coverage, particularly in both air mass storms and large multicellular events, with R2 up to 70%. © 2012 American Meteorological Society. Nguyen Minh Truong, ., Tran Tan Tien, ., Pielke, R. A., Castro, C. L., & Leoncini, G. (2012). A Modified Kain-Fritsch Scheme and Its Application for the Simulation of an Extreme Precipitation Event in Vietnam. MONTHLY WEATHER REVIEW , 137(2), 766-789. Truong, N. M., Hang, V. T., Pielke Sr., R. A., Castro, C. L., & Dairaku, K. (2012). Synoptic-scale physical mechanisms associated with the Mei-yu front: A numerical case study in 1999. Asia-Pacific Journal of Atmospheric Sciences , 48(4), 433-448. Abstract: The Mei-yu front system occurring from 23 to 27 June 1999 consists of the Mei-yu front and the dewpoint front, which confine a warm core extending from the eastern flank of the Tibetan Plateau to the west of 145 E. To further understand the synopticscale physical mechanisms associated with the Mei-yu front system, the present study proposes another insight into the physical significance of the x-component relative vorticity (XRV) whose vertical circulation is expected to tilt isentropic surfaces. The XRV equation diagnoses exhibit that the twisting effect of the planetary vorticity (TEPV) is positive along the Mei-yu front and negative in the dewpoint front region, and tilts isentropic surfaces from south to north in the Mei-yu frontal zone. Conversely, the meridional gradient of the atmospheric buoyancy (MGAB) tilts isentropic surfaces in the opposite direction and maintains negative in the regions where the TEPV is positive and vice versa. Thus, the TEPV plays the role of the Mei-yu frontogenesis, whereas the MGAB demonstrates the Meiyu frontolysis factor. Both terms control the evolution of the cross-front circulation. The other terms show much minor contributions in this case study. The present simulations also indicate that the weakening of the upper-level jet evidently induces the weakening of the Mei-yu front and reduces the amplitude of the East Asia cold trough. Furthermore, the impact can also penetrate into the lower troposphere in terms of mesoscale disturbances and precipitation, proving that the upper-level jet imposes a noticeable top-down influence on the Mei-yu front system. © 2012 Korean Meteorological Society and Springer Science+Business Media Dordrecht. Castro, C. L., Pielke, R. A., & Adegoke, J. O. (2011). Investigation of the summer climate of the contiguous United States and Mexico using the regional atmospheric modeling system (RAMS). Part 1: Model climatology (1950-2002). JOURNAL OF CLIMATE , 20(15), 3844-3865. Castro, C. L., Pielke, R. A., Adegoke, J. O., Schubert, S. D., & Pegion, P. J. (2009). Investigation of the summer climate of the contiguous United States and Mexico using the regional atmospheric modeling system (RAMS). Part II: Model climate variability. JOURNAL OF CLIMATE , 20(15), 3866-3887. Castro, L. C., Beltrán-Przekurat, A. B., & Pielke, R. (2009). Spatiotemporal variability of precipitation, modeled soil moisture, and vegetation greenness in North America within the recent observational record. Journal of Hydrometeorology , 10(6), 1355-1378. Abstract: Dominant spatiotemporal patterns of precipitation, modeled soil moisture, and vegetation are determined in North America within the recent observational record (late twentieth century onward). These data are from a gridded U.S.-Mexico precipitation product, retrospective long-term integrations of two land surface models, and satellite-derived vegetation greenness. The analysis procedure uses three statistical techniques. First, all the variables are normalized according to the standardized precipitation index procedure. Second, dominant patterns of spatiotemporal variability are determined using multitaper method-singular value decomposition for interannual and longer time scales. The dominant spatiotemporal patterns of precipitation generally conform to known and distinct Pacific SST forcing in the cool and warm seasons. Two specific time scales in precipitation at 9 and 6-7 yr correspond to significant variability in soil moisture and vegetation, respectively. The 9-yr signal is related to precipitation in late fall to early winter, whereas the 6-7-yr signal is related to earlysummer precipitation. Canonical correlation analysis is finally used to confirm that strong covariability between land surface variables and precipitation exists at these specific times of the year. Both signals are strongest in the central and western United States and are consistent with prior global modeling and paleoclimate studies that have investigated drought in North America. © 2009 American Meteorological Society. Manuel Minjarez-Sosa, C., Castro, C. L., Cummins, K. L., Krider, E. P., & Waissmann, J. (2009). Toward Development of Improved QPE in Complex Terrain Using Cloud-to-Ground Lightning Data: A Case Study for the 2005 Monsoon in Southern Arizona. JOURNAL OF HYDROMETEOROLOGY , 13(6), 1855-1873. Nguyen Minh Truong, ., Vu Thanh Hang, ., Pielke, R. A., Castro, C. L., & Dairaku, K. (2009). Synoptic-scale physical mechanisms associated with the Mei-yu front: A numerical case study in 1999. ASIA-PACIFIC JOURNAL OF ATMOSPHERIC SCIENCES , 48(4), 433-448. Switanek, M. B., Troch, P. A., & Castro, C. L. (2009). Improving Seasonal Predictions of Climate Variability and Water Availability at the Catchment Scale. JOURNAL OF HYDROMETEOROLOGY , 10(6), 1521-1533. Truong, N. M., Tien, T. T., Pielke Sr., R. A., Castro, C. L., & Leoncini, G. (2009). A modified Kain-Fritsch scheme and its application for the simulation of an extreme precipitation event in Vietnam. Monthly Weather Review , 137(2), 766-789. Abstract: From 24 to 26 November 2004, an extreme heavy rainfall event occurred in the mountainous provinces of central Vietnam, resulting in severe flooding along local rivers. The Regional Atmospheric Modeling System, version 4.4, is used to simulate this event. In the present study, the convective parameterization scheme includes the original Kain-Fritsch scheme and a modified one in which a new diagnostic equation to compute updraft velocity, closure assumption, and trigger function are developed. These modifications take the vertical gradient of the Exner function perturbation into account, with an on-off coefficient to account for the role of the advective terms. According to the event simulations, the simulated precipitation shows that the modified scheme with the new trigger function gives much better results than the original one. Moreover, the interaction between convection and the larger-scale environment is much stronger near the midtroposphere where the return flow associated with lower-level winter monsoon originates. As a result, the modified scheme produces larger and deeper stratiform clouds and leads to a significant amount of resolvable precipitation. On the contrary, the resolvable precipitation is small when the original scheme is used. The improvement in the simulated precipitation is caused by a more explicit physical mechanism of the new trigger function and suggests that the trigger function needs to be developed along with other components of the scheme, such as closure assumption and cloud model, as a whole. The formalistic inclusion of the advective terms in the new equation gives almost no additional improvement of the simulated precipitation. © 2009 American Meteorological Society. Weiss, J. L., Castro, C. L., & Overpeck, J. T. (2009). Distinguishing Pronounced Droughts in the Southwestern United States: Seasonality and Effects of Warmer Temperatures. JOURNAL OF CLIMATE , 22(22), 5918-5932. Abstract: Higher temperatures increase the moisture-holding capacity of the atmosphere and can lead to greater atmospheric demand for evapotranspiration, especially during warmer seasons of the year. Increases in precipitation or atmospheric humidity ameliorate this enhanced demand, whereas decreases exacerbate it. In the southwestern United States (Southwest), this means the greatest changes in evapotranspirational demand resulting from higher temperatures could occur during the hot-dry foresummer and hot-wet monsoon. Here seasonal differences in surface climate observations are examined to determine how temperature and moisture conditions affected evapotranspirational demand during the pronounced Southwest droughts of the 1950s and 2000s, the latter likely influenced by warmer temperatures now attributed mostly to the buildup of greenhouse gases. In the hot-dry foresummer during the 2000s drought, much of the Southwest experienced significantly warmer temperatures that largely drove greater evapotranspirational demand. Lower atmospheric humidity at this time of year over parts of the region also allowed evapotranspirational demand to increase. Significantly warmer temperatures in the hot-wet monsoon during the more recent drought also primarily drove greater evapotranspirational demand, but only for parts of the region outside of the core North American monsoon area. Had atmospheric humidity during the more recent drought been as low as during the 1950s drought in the core North American monsoon area at this time of year, greater evapotranspirational demand during the 2000s drought could have been more spatially extensive. With projections of future climate indicating continued warming in the region, evapotranspirational demand during the hot-dry and hot-wet seasons possibly will be more severe in future droughts and result in more extreme conditions in the Southwest, a disproportionate amount negatively impacting society. © 2009 American Meteorological Society. Castro, C. L., Beltran-Przekurat, A. B., & Pielke, R. A. (2008). Spatiotemporal Variability of Precipitation, Modeled Soil Moisture, and Vegetation Greenness in North America within the Recent Observational Record. JOURNAL OF HYDROMETEOROLOGY , 10(6), 1355-1378. Lyon, S. W., Dominguez, F., Gochis, D. J., Brunsell, N. A., Castro, C. L., Chow, F. K., Fan, Y., Fuka, D., Hong, Y., Kucera, P. A., Nesbitt, S. W., Salzmann, N., Schmidli, J., Synder, P. K., Teuling, A. J., Twine, T. E., Levis, S., Lundquist, J. D., Salvucci, G. D., , Sealy, A. M., et al. (2008). Coupling terrestrial and atmospheric water dynamics to improve prediction in a changing environment. Bulletin of the American Meteorological Society , 89(9), 1275-1279. Abstract: Atmospheric scientists see a potential in the improvement of climate prediction by coupling terrestrial and atmospheric water dynamics. This is also important to understand local processes such as evapotranspiration and streamflow. Simplifications in numerical models that pertain to terrestrial hydrology must also be addressed because such simplifications can limit the numerical prediction capabilities with respect to how water partition capabilities with respect to how water partitions itself throughout all phases of the cycle. When simplifications have been addressed, understanding the feedback interactions between the land surface and the atmosphere can be done by defining improved feedback metrics for assessing the relative magnitude of soil moisture, vegetation, and snow feedbacks on the atmosphere. There will also be a need on models as groundwater flow, unsaturated zone subsurface flow, atmospheric flow, vegetation dynamics, and landsurface modules that link below and above-ground hydrologic and biogeochemical regimes. Rockel, B., Castro, C. L., Pielke Sr., R. A., Storch, H. v., & Leoncini, G. (2008). Dynamical downscaling: Assessment of model system dependent retained and added variability for two different regional climate models. Journal of Geophysical Research D: Atmospheres , 113(21). Abstract: In this paper, we compare the retained and added variability obtained using the regional climate model CLM (Climate version of the Local Model of the German Weather Service) to an earlier study using the RAMS (Regional Atmospheric Modeling System) model. Both models yield similar results for their standard configurations with a commonly used nudging technique applied to the driving model fields. Significantly both models do not adequately retain the large-scale variability in total kinetic energy with results poorer on a larger grid domain. Additional experiments with interior nudging, however, permit the retention of large-scale values for both models. The spectral nudging technique permits more added variability at smaller scales than a four-dimensional internal grid nudging on large domains. We also confirmed that dynamic downscaling does not retain (or increase) simulation skill of the large-scale fields over and beyond that which exists in the larger-scale model or reanalysis. Our conclusions should be relevant to all applications of dynamic downscaling for regional climate simulations. Copyright 2008 by the American Geophysical Union. Wi, S., Dominguez, F., Durcik, M., Valdes, J., Diaz, H. F., & Castro, C. L. (2008). Climate change projection of snowfall in the Colorado River Basin using dynamical downscaling. WATER RESOURCES RESEARCH , 48. Castro, C. L., Pielke Sr., R. A., & Adegoke, J. O. (2007). Investigation of the summer climate of the contiguous United States and Mexico using the Regional Atmospheric Modeling System (RAMS). Part I: Model climatology (1950-2002). Journal of Climate , 20(15), 3844-3865. Abstract: Fifty-three years of the NCEP-NCAR Reanalysis I are dynamically downscaled using the Regional Atmospheric Modeling System (RAMS) to generate a regional climate model (RCM) climatology of the contiguous United States and Mexico. Data from the RAMS simulations are compared to the recently released North American Regional Reanalysis (NARR), as well as observed precipitation and temperature data. The RAMS simulations show the value added by using a RCM in a process study framework to represent North American summer climate beyond the driving global atmospheric reanalysis. Because of its enhanced representation of the land surface topography, the diurnal cycle of convective rainfall is present. This diurnal cycle largely governs the transitions associated with the evolution of the North American monsoon with regards to rainfall, the surface energy budget, and surface temperature. The lower frequency modes of convective rainfall, though weaker, account for rainfall variability at a remote distance from elevated terrain. As in previous studies with other RCMs, RAMS precipitation is overestimated compared to observations. The Great Plains low-level jet (LLJ) is also well represented in both RAMS and NARR, but the Baja LLJ and associated gulf surges are not. © 2007 American Meteorological Society. Castro, C. L., Pielke Sr., R. A., Adegoke, J. O., Schubert, S. D., & Pegion, P. J. (2007). Investigation of the summer climate of the contiguous United States and Mexico using the Regional Atmospheric Modeling System (RAMS). Part II: Model climate variability. Journal of Climate , 20(15), 3866-3887. Abstract: Summer simulations over the contiguous United States and Mexico with the Regional Atmospheric Modeling System (RAMS) dynamically downscaling the NCEP-NCAR Reanalysis I for the period 1950-2002 (described in Part I of the study) are evaluated with respect to the three dominant modes of global SST. Two of these modes are associated with the statistically significant, naturally occurring interannual and interdecadal variability in the Pacific. The remaining mode corresponds to the recent warming of tropical sea surface temperatures. Time-evolving teleconnections associated with Pacific SSTs delay or accelerate the evolution of the North American monsoon. At the period of maximum teleconnectivity in late June and early July, there is an opposite relationship between precipitation in the core monsoon region and the central United States. Use of a regional climate model (RCM) is essential to capture this variability because of its representation of the diurnal cycle of convective rainfall. The RCM also captures the observed long-term changes in Mexican summer rainfall and suggests that these changes are due in part to the recent increase in eastern Pacific SST off the Mexican coast. To establish the physical linkage to remote SST forcing, additional RAMS seasonal weather prediction mode simulations were performed and these results are briefly discussed. In order for RCMs to be successful in a seasonal weather prediction mode for the summer season, it is required that the GCM provide a reasonable representation of the teleconnections and have a climatology that is comparable to a global atmospheric reanalysis. © 2007 American Meteorological Society. Lyon, S. W., Dominguez, F., Gochis, D. J., Brunsell, N. A., Castro, C. L., Chow, F. K., Fan, Y., Fuka, D., Hong, Y., Kucera, P. A., Nesbitt, S. W., Salzmann, N., Schmidli, J., Snyder, P. K., Teuling, A. J., Twine, T. E., Levis, S., Lundquist, J. D., Salvucci, G. D., , Sealy, A. M., et al. (2007). Coupling terrestrial and atmospheric water dynamics to improve prediction in a changing environment. BULLETIN OF THE AMERICAN METEOROLOGICAL SOCIETY , 89(9), 1275-1279. Pielke Sr., R., Stokowski, D., Wang, J., Vukicevic, T., Leoncini, G., Matsui, T., Castro, C. L., Niyogi, D., Kishtawal, C. M., Biazar, A., Doty, K., McNider, R. T., Nair, U., & Tao, W. (2007). Satellite-based model parameterization of diabetic heating. Eos , 88(8), 96-97. Rockel, B., Castro, C. L., Pielke, R. A., von Storch, H., & Leoncini, G. (2007). Dynamical downscaling: Assessment of model system dependent retained and added variability for two different regional climate models. JOURNAL OF GEOPHYSICAL RESEARCH-ATMOSPHERES , 113(D21). Adegoke, J. O., Vezhapparambu, S., Castro, C. L., Pielke, R. A., & Carleton, A. M. (2006). Influence of variations in low-level moisture and soil moisture on the organization of summer convective systems in the U.S. midwest. 86th AMS Annual Meeting . Castro, C. L., Pielke Sr., R. A., & Leoncini, G. (2005). Dynamical downscaling: Assessment of value retained and added using the Regional Atmopsheric Modeling System (RAMS). Journal of Geophysical Research D: Atmospheres , 110(5), 1-21. Abstract: The value restored and added by dynamical downscaling is quantitatively evaluated by considering the spectral behavior of the Regional Atmospheric Modeling System (RAMS) in relation to its domain size and grid spacing. A regional climate model (RCM) simulation is compared with NCEP Reanalysis data regridded to the RAMS grid at each model analysis time for a set of six basic experiments. At large scales, RAMS underestimates atmospheric variability as determined by the column integrated kinetic energy and integrated moisture flux convergence. As the grid spacing increases or domain size increases, the underestimation of atmospheric variability at large scales worsens. The model simulated evolution of the kinetic energy relative to the reanalysis regridded kinetic energy exhibits a decrease with time, which is more pronounced with larger grid spacing. Additional follow-on experiments confirm that the surface boundary forcing is the dominant factor in generating atmospheric variability for small-scale features and that it exerts greater control on the RCM solution as the influence of lateral boundary conditions diminish. The sensitivity to surface forcing is also influenced by the model parameterizations, as demonstrated by using a different convection scheme. For the particular case considered, dynamical downscaling with RAMS in RCM mode does not retain value of the large scale which exists in the larger global reanalysis. The utility of the RCM, or value added, is to resolve the smaller-scale features which have a greater dependence on the surface boundary. This conclusion regarding RAMS is expected to be true for other RCMs as well. Copyright 2005 by the American Geophysical Union. Hanamean Jr., J. R., Pielke Sr., R. A., Castro, C. L., Ojima, D. S., Reed, B. C., & Gao, Z. (2003). Vegetation greenness impacts on maximum and minimum temperatures in northeast Colorado. Meteorological Applications , 10(3), 203-215. Abstract: The impact of vegetation on the microclimate has not been adequately considered in the analysis of temperature forecasting and modelling. To fill part of this gap, the following study was undertaken. A daily 850-700 mb layer mean temperature, computed from the National Center for Environmental Prediction-National Center for Atmospheric Research (NCEP-NCAR) reanalysis, and satellite-derived greenness values, as defined by NDVI (Normalised Difference Vegetation Index), were correlated with surface maximum and minimum temperatures at six sites in northeast Colorado for the years 1989-98. The NDVI values, representing landscape greenness, act as a proxy for latent heat partitioning via transpiration. These sites encompass a wide array of environments, from irrigated-urban to short-grass prairie. The explained variance (r 2 value) of surface maximum and minimum temperature by only the 850-700 mb layer mean temperature was subtracted from the corresponding explained variance by the 850-700 mb layer mean temperature and NDVI values. The subtraction shows that by including NDVI values in the analysis, the r 2 values, and thus the degree of explanation of the surface temperatures, increase by a mean of 6% for the maxima and 8% for the minima over the period March-October. At most sites, there is a seasonal dependence in the explained variance of the maximum temperatures because of the seasonal cycle of plant growth and senescence. Between individual sites, the highest increase in explained variance occurred at the site with the least amount of anthropogenic influence. This work suggests the vegetation state needs to be included as a factor in surface temperature forecasting, numerical modeling, and climate change assessments. Castro, C. L., McKee, T. B., & Pielke Sr., R. A. (2001). The relationship of the North American Monsoon to tropical and North Pacific Sea surface temperatures as revealed by observational analyses. Journal of Climate , 14(24), 4449-4473. Abstract: The North American monsoon is a seasonal shift of upper- and low-level pressure and wind patterns that brings summertime moisture into the southwest United States and ends the late spring wet period in the Great Plains. The interannual variability of the North American monsoon is examined using the NCEP-NCAR reanalysis (1948-98). The diurnal and seasonal evolution of 500-mb geopotential height, integrated moisture flux, and integrated moisture flux convergence are constructed using a 5-day running mean for the months May through September. All of the years are used to calculate an average daily Z score that removes the diurnal, seasonal. and intraseasonal variability. The 30-day average Z score centered about the date is correlated with Pacific sea surface temperature anomaly (SSTA) indices associated with the El Niõ-Southern Oscillation (ENSO) and the North Pacific oscillation (NPO). These indices are Niõ-3. a North Pacific index, and a Pacific index that combines the previous two. Regional time-evolving precipitation indices for the Southwest and Great Plains, which consider the total number of wet or dry stations in a region, are also correlated with the SSTA indices. The use of nonnormally distributed point source precipitation data is avoided. Teleconnections are computed relative to the climatological evolution of the North American monsoon, rather than to calendar months, thus more accurately accounting for the climatological changes in the large-scale circulation. Tropical and North Pacific SSTs are related to the occurrence of the Pacific Transition and East Pacific teleconnection patterns, respectively, in June and July. A high (low) NPO phase and El Niõ (La Niã) conditions favor a weaker (stronger) and southward (northward) displaced monsoon ridge. These teleconnection patterns affect the timing and large-scale distribution of monsoon moisture. In the Great Plains, the spring wet season is lengthened (shortened) and early summer rainfall and integrated moisture flux convergence are above (below) average. In the Southwest, monsoon onset is late (early) and early summer rainfall and integrated moisture flux convergence are below (above) average. Relationships with Pacific SSTA indices decay in the later part of the monsoon coincident with weakening of the jet stream across the Pacific and strengthening of the monsoon ridge over North America. The most coherent summer climate patterns occur over the entire western United States when the Pacific index is substantially high or low, such as during the Midwest flood of 1993 and drought of 1988. The Pacific index in spring is a good predictor of early summer height anomalies over the western United States when the time evolution of the North Pacific SST dipole is considered. Shamir, E., Shamir, E., Carillo, C., Carillo, C., Castro, C. L., Castro, C. L., Chang, H., Chang, H., Megdal, S. B., Megdal, S. B., Eden, S., Eden, S., Prietto, J., & Prietto, J. (2014, June 2014). Water resources vulnerability to climate change in the Upper Santa Cruz River, Arizona. In 7th International Congress on Environmental Modelling and Software (iEMSs) , 8. Goodrich, D., Unkrich, C., Lahmers, T., Castro, C. L., Gupta, H. V., Hazenberg, P., & Wang, Y. H. (2019, Spring). Demonstrating the Added Values of Suction Losses for Channel Infiltration in WRF-Hydro Hydrologic Model and its Applications in Semiarid Region . 2019 Meeting of the American Meteorological Society, Phoenix Arizona, Jan 6-10.. Phoenix, Arizona: AMS. Wang YH, P Hazenberg, H Gupta, C Castro, T Lahmers, C Unkrich and D Goodrich (2019), Demonstrating the Added Values of Suction Losses for Channel Infiltration in WRF-Hydro Hydrologic Model and its Applications in Semiarid Region, session on "Integrated Metrics and Benchmarking for Next-Generation Hydro/Land-Surface Modeling of the Water Cycle”, presented at 2019 Meeting of the American Meteorological Society, Phoenix Arizona, Jan 6-10. Yates, D., Dugger, A., Gochis, D. J., Castro, C. L., Gupta, H. V., Hazenberg, P., & Lahmers, T. (2019, Spring). Enhancements to the WRF-Hydro Hydrologic Model Structure for Semi-Arid Environments . 2019 Meeting of the American Meteorological Society, Phoenix Arizona, Jan 6-10.. Phoenix, Arizona: AMS. Lahmers TM, P Hazenberg, H Gupta, C Castro, D Gochis, A Dugger, D Yates, L Read, L Karsten, YH Wang , RJ Zamora and B Cosgrove (2019), Enhancements to the WRF-Hydro Hydrologic Model Structure for Semi-arid Environments, presented at 2019 Meeting of the American Meteorological Society, Phoenix Arizona, Jan 6-10. Castro, C. L. (2018, April). The more extreme nature of North American monsoon precipitation in the Southwestern United States . Climate Assessment for the Southwest and Water Research Resource Center (WRRC) Seminar Series, University of Arizona. Castro, C. L. (2018, February). The more extreme nature of North American monsoon precipitation in the Southwestern United States . Arizona Chapter of the American Meteorological Society, Annual Meeting. Arizona State University. Castro, C. L. (2018, January). The more extreme nature of North American monsoon precipitation in the Southwest United States. . 98th Annual American Meteorological Society Meeting. Castro, C. L. (2018, March). The more extreme nature of North American monsoon precipitation in the Southwestern United States. . Southwest Extreme Precipitation Symposium, Scripps Institution of Oceanography..
Castro, C. L. (2018, March). The more extreme nature of North American monsoon precipitation in the Southwestern United States . Institute for Energy Solutions Workshop, University of Arizona. Goodrich, D. C., Dugger, A., Yates, D., Gochis, D. J., Castro, C. L., Hazenberg, P., Gupta, H. V., & Lahmers, T. (2018, Spring). Enhancements to the WRF-Hydro Hydrologic Model Structure for Semi-Arid Environments . 32nd AMS Conference on Hydrology, 98th Annual AMS Meeting, Austin, Texas, 7-11 Jan.. Austin, Texas: AMS. Lahmers TM, H Gupta, P Hazenberg, CL Castro, DJ Gochis, D Yates, A Dugger, DC Goodrich (2018), Enhancements to the WRF-Hydro Hydrologic Model Structure for Semi-Arid Environments, presented at 32nd AMS Conference on Hydrology, 98th Annual AMS Meeting, Austin, Texas, 7-11 Jan.
Goodrich, D., Unkrich, C., Lahmers, T., Castro, C. L., Gupta, H. V., Hazenberg, P., & Wang, Y. H. (2018, Fall 2018). Demonstrating the Added Values of Suction Losses for Channel Infiltration in WRF-Hydro Hydrologic Model and its Applications in Semiarid Region . 2018 Fall Meeting of the American Geophysical Union. Washington DC: American Geophysical Union. Wang YH, P Hazenberg, H Gupta, C Castro, T Lahmers, C Unkrich and D Goodrich (2018), Demonstrating the Added Values of Suction Losses for Channel Infiltration in WRF-Hydro Hydrologic Model and its Applications in Semiarid Region, session H046: Diagnostics, Sensitivity and Uncertainty Analysis of Earth and Environmental Modeling, presented at 2018 Fall Meeting of the American Geophysical Union, Washington DC, Dec 10-14. Lahmers, T., Hazenberg, P., Gupta, H. V., Castro, C. L., Gochis, D. J., Dugger, A., Yates, D., Yates, D., Dugger, A., Gochis, D. J., Castro, C. L., Gupta, H. V., Hazenberg, P., & Lahmers, T. (2018, Fall 2018). Enhancements to the WRF-Hydro Hydrologic Model Structure for Semi-Arid Environments . 2018 Fall Meeting of the American Geophysical Union. Washington, DC: AGU. Lahmers TM, P Hazenberg, H Gupta, C Castro, D Gochis, A Dugger, D Yates, L Read, L Karsten, YH Wang, RJ Zamora and B Cosgrove (2018), Enhancements to the WRF-Hydro Hydrologic Model Structure for Semi-arid Environments, session on Research, Development and Evaluation of the National Water Model and Facilitation of Community Involvement, presented at 2018 Fall Meeting of the American Geophysical Union, Washington DC, Dec 10-14. Castro, C. L. (2017, April). Evaluating changes in extreme events during the North American monsoon using convective-permitting regional atmospheric modeling. . Invited department seminar: Jackson School of Geosciences, University of Texas at Austin. Castro, C. L. (2017, March). The more extreme nature of North American monsoon precipitation in the Southwest United States . Invited seminar: Centro de Previsão de Tempo e Estudios Climáticos (CPTEC). Cachoeira Paulista, Brazil. Castro, C. L. (2017, May). Potential for Improved S2S Forecasts of the North American Monsoon . Workshop on improving the skill of long-rang weather forecasts (subseasonal to seasonal (S2S) precipitation forecasting. Western States Water Council and California Department of Water Resources. Castro, C. L. (2017, November). Assessing Climate Change Impacts for DoD Installations in the Southwest United States During the Warm Season . SERDP and ESTCP 2017 Symposium. Castro, C. L. (2017, October). CORDEX Latinoamérica: Proyección del cambio climático en la escala regional para la toma de decisiones y evaluación de sus impactos. [English Translation: Latin American CORDEX: Climate change projection at the regional scale for decision making and impacts evaluation] . 13 Reunión de Consulta de la Comisión de Geofísica. Pan American Institute for Geography and History.. Panama City, Panama. Castro, C. L. (2017, October). More Extreme Monsoon Precipitation in the Southwestern U.S. and the Potential Implications for DoD Facilities. . New Resource Conservation Insights in Desert Environments. SERDP & ESTCP Webinar Series..
Castro, C. L., Ochoa, C. A., Chang, H. I., Mejia, J., & Angel, M. C. (2017, Dec). Annual and Diurnal Precipitation Distributions as Simulated by WRF-based CORDEX-Central America . American Geophysical Union Annual Meeting. Smith, M., Dugger, A., Gochis, D. J., Gupta, H. V., Castro, C. L., & Lahmers, T. (2017, Spring). Enhancing the NOAA National Water Center WRF-Hydro model architecture to improve representation of the Midwest and Southwest CONUS climate regions . 31st Conference on Hydrology, Seattle, WA, American Meteorological Society.. Seattle, WA: American Meteorological Society..
Lahmers TM, CL Castro, H Gupta, DJ Gochis, A Dugger, and M Smith (2017), Enhancing the NOAA National Water Center WRF-Hydro model architecture to improve representation of the Midwest and Southwest CONUS climate regions, 31st Conference on Hydrology, Seattle, WA, American Meteorological Society. Castro, C. L. (2016, April). Toward physically confident climate change projections in the Southwest United States and beyond . Invited seminar: Department of Atmospheric Sciences, University of Washington. Department of Atmospheric Sciences, University of Washington, Seattle, WA. Castro, C. L. (2016, November 2016). Evaluating changes in extreme events during the North American monsoon using convective-permitting regional atmospheric modeling . Second Workshop on Climate Change, Variability, and Modleling over Central America and Mexico. University of Costa Rica, School of Physics and Geophysical Research. Castro, C. L. (2016, October). Las capacidades emergentes de modelos atmosféricos que permiten convección en la investigación del climate [English Translation: Emerging capabilities in convective-permitting atmospheric models in climate research] . Sexto Congreso Nacional de Investigación en Cambio Climático, Zona Noroeste [English Translation: Sixth National Congress on Climate Change Research, Northwest Zone]. University of Sonora, Hermosillo, Sonora, Mexico. Lahmers, T., Castro, C. L., Gupta, H. V., Gochis, D., Dugger, A., & Smith, M. (2016, Fall). Enhancing the NOAA National Water Center WRF-Hydro model architecture to improve representation of the Midwest and Southwest CONUS climate regions . 2016 Fall Meeting of the American Geophysical Union. Means, L., Arritt, R. W., Chang, H., Castro, C. L., Christensen, J. H., Christensen, O. B., Frigon, A., Gutowski, W. J., Kjellstrom, E., Laprise, R., McGinnis, S. A., Nikulin, G., Scinocca, J. F., Sushama, L., & Winger, K. (2016, December). NA-CORDEX: Overview and Sample Results . 2016 American Geophysical Union Fall Meeting. San Francisco, CA. Moker, Jr., J. M., Arellano, Jr., A. F., Castro, C. L., & Serra, Y. (2016, January). Impact of Total Precipitable Water Assimilation into North American Monsoon Precipitation Forecasts . 96th Annual American Meteorological Society Meeting, 30th Conference on Hydrology. New Orleans, LA. Carrillo, C., Castro, C. L., Garfin, G., Chang, H., & Bukovsky, M. (2015, January). Evaluation of the ENSO and PDV natural climate variability on the North American monsoon region using a set of CMIP3 dynamically downscaled products . 29th Conference on Hydrology, 95th Annual American Meteorological Society Meeting. Phoenix, Arizona. Castro, C. L. (2015, July). Climate Change in the Southwest: What we know and don't know . SERDP-NOAA Climate Change Meeting. Boulder, Colorado. Castro, C. L. (2015, June). Convective organization and modeling for the North American monsoon . Tercer Encuentro de Climatología y Meteorología Del Noroeste de México. Mexico City. Castro, C. L. (2015, March). El uso de modelos atmosféricos para mejorar predicciones del tiempo y proyecciones del clima en Méxio y Centroamérica (In Spanish) [English translation: The use of regional models to improve weather forecasts and climate projections in Mexico and Central America] . Invited, Seminar. Centro de Ciencias de la Atmósfera, Universidad Nacional Autónoma de México. Mexico City. Castro, C. L. (2015, September). The North American Monsoon: It's What Makes Summer Weather Interesting the Southwest U.S. . CoCoRAHS webinar series. Colorado State University (webinar). Castro, C. L. (2015, September). The use of regional atmospheric models to improve weather forecasts and climate projections for the North American monsoon . Invited Seminar, Applied Physics Laboratory, University of Washington. Castro, C. L., Chang, H., Luong, T., Lahmers, T., Jares, M., & Carrillo, C. (2015, January). Projecting future changes in extreme weather during the North American monsoon in the Southwest with high resolution, convective-permitting regional atmospheric modeling . 29th Conference on Hydrology, 95th Annual American Meteorological Society Meeting. Phoenix, Arizona. Castro, C. L., Chang, H., Mearns, L., & Bukovsky, M. (2015, Fall). Trend of climate extremes in North America: A comparison between dynamically downscaled CMIP3 and CMIP5 simulations . American Geophysical Union Fall Meeting. San Francisco, California. Castro, C. L., Moker, J., Serra, Y., Arellano, A., & Adams, D. K. (2015, November). El uso de modelos atmosféricos para mejorar predicciones del tiempo en la región del monzón de Norteamérica (In Spanish) [English translation: The use of atmospheric models to improve weather forecast prediction in the North American monsoon region] . Reunón anual de Unión Geofísica Mexicano. Puerto Vallarta, Mexico. Chang, H. I., Castro, C. L., Mearns, L., & Bukovsky, M. (2015, December). Trend of climate extremes in North America: A comparison between dynamically downscaled CMIP3 and CMIP5 simulations . American Geophysical Union Annual Meeting. San Francisco, CA: American Geophysical Union. Chang, H. I., Castro, C. L., Mearns, L., & Bukovsky, M. (2015, October). North American climate extremes and the relationship with natural variability in dynamically downscaled CMIP3 and CMIP5 projections . Int. WS: Issues in downscaling of climate change projection. Tsukuba, Japan: Japan Meteorological Research Institute. Lahmers, T., Castro, C. L., & Gupta, H. V. (2015, Fall). Optimization of precipitation and streamflow forecasts in the southwest Contiguous US for warm season convection . 2015 Fall Meeting of the American Geophysical Union, San Francisco CA. San Francisco CA: American Geophysical Union. Lahmers, T., Castro, C. L., Serra, Y., & Brost, J. (2015, January). Assessment of long-term trends of transient inverted tough climatology over the North American Monsoon region from four dynamically downscaled GCMs . 29th Conference on Hydrology, 95th Annual American Meteorological Society Meeting. Phoenix, Arizona. Luong, T., Castro, C. L., Grossman-Clarke, S., Jares, M., Chang, H., & Carriloo, C. (2015, January). Urban effects on North American monsoon precipitation of 2002-2010: a study within the context of severe weather events . 27th Conference on Climate Variability and Change, 95th Annual American Meteorological Society Meeting. Phoenix, Arizona. Moker, Jr., J. M., Serra, Y., Castro, C. L., & Arellano, Jr., A. (2015, January). Impact of Precipitable Water on Forecasting the 2013 North American Monsoon . 29th conference on Hydrology, 95th American Meteorological Society Meeting. Phoenix, Arizona. Roy, T., Roy, T., Serrat-Capdevilla, A., Serrat-Capdevilla, A., Gupta, H. V., Gupta, H. V., Valdes, J. B., & Valdes, J. B. (2015, Fall). Streamflow Forecasting using Satellite Products: A Benchmark Approach. Can We Reduce Uncertainty by using Multiple Products and Multiple Models? . 2015 Fall Meeting of the American Geophysical Union, San Francisco CA. San Francisco CA: American Geophysical Union. Roy, T., Roy, T., Serrat-Capdevilla, A., Serrat-Capdevilla, A., Gupta, H. V., Gupta, H. V., Valdes, J. B., & Valdes, J. B. (2015, Summer). Estimating uncertainties in streamflow forecasts using a Bayesian multi-model and multi-product approach . 2015 UCOWR/NIWR/CUAHSI Annual Conference “Water is Not for Gambling: Utilizing Science to Reduce Uncertainty”, Green Valley Ranch Resort Henderson, NV. Green Valley Ranch Resort Henderson, NV: UCOWR/NIWR/CUAHSI Annual Conference. Seastrand, S., Serra, Y., Castro, C. L., & Ritchie, E. (2015, January). The Dominant Synoptic-Scale Modes of North American Monsoon Precipitation . 29th Conference on Hydrology, 95th Annual American Meteorological Society Meeting. Shamir, E., Carrillo, C., Castro, C. L., Chang, H. I., Megdal, S. B., Eden, S., & Prietto, J. (2015, June). Water resources vulnerability to climate change in the Upper Santa Cruz River, Arizona . Proceedings of the 7th International Congress on Environmental Modelling and Software. San Diego, CA: International Congress on Environmental Modelling and Software. Carrillo, C., Castro, C. L., Chang, H., & Luong, T. (2014, December). Evidence of a low-frequency climate variability mode in the North American Monsoon System as diagnosed by a dynamically downscaled 20th Century Reanalysis . American Geophysical Union Fall Meeting. San Francisco, California. Castro, C. L. (2014, December). Ensuring a robust regional model experimental design for future projection of extreme weather during the North American monsoon in the Southwest United States . Invited Presentation, U.S. Army Research Laborary. Las Cruces, New Mexico. Castro, C. L. (2014, June). Creating a unified perspective of the North American monsoon: from the paleoclimate record to climate change projections . Invited Presentation at BTU Cottbus and Free University of Berlin. Berlin, Germany, and Cottbus, Germany. Castro, C. L. (2014, November). Climate Variability and change and the North American monsoon: What have we learned since NAME and where are we going? . Reunión anual de Unión Geofísica Mexicana. Puerto Vallarta, Mexico. Castro, C. L., Chang, H., Luong, T., Jares, M., Lahmers, T., & Carrillo, C. (2014, June). Ensuring a robust regional model experimental design for future projection of extreme weather during the North American monsoon in the Southwest United States . 21st Century Challenges in Regional Climate Modeling Workshop. Lund, Sweden. Castro, C. L., Chang, H., Woodhouse, C., Carrillo, C., Ciancarelli, B., & Griffin, D. (2014, January). Creating a unified perspective of the North American monsoon: from the paleoclimate record to climate change projections . 28th Conference on Hydrology, 94th Annual American Meteorological Society Meeting. Atlanta, Georgia. Lahmers, T., Castro, C. L., Serra, Y., & Brost, J. (2014, January). Long-term changes in the climatology of transient inverted troughs over the North American Monsoon region and their effects on severe weather . 26th Conference on Weather Analysis and Forecasting, 22nd Conference on Numerical Weather Prediction, 94th Annual American Meteorological Society Meeting. Atlanta, Georgia. Shamir, E., Megdal, S., Eden, S., Castro, C. L., Carrillo, C., & Chang, H. (2014, January). Assessment of climate change impact on groundwater reservoirs and water resource management in Upper Santa Cruz River, Arizona . 28th Conference on Hydrology, 94th Annual American Meteorological Society Meeting. Atlanta, Georgia. Castro, C. L. (2013, November). Proyecciones del cambio climático en Latinoamérica: Cómo se puede generar información útil en la escala regional para tomar decisiones? [English translation: Climate Change projections in Latin America: how can useful information be generated on the regional scale for decision making?} . 12th Reunión de Consulta de la Comisión de Geofísica. Instituto Panamericano de Geografía e Historia.. Montevideo, Uruguay. Castro, C. L., Chang, H., & Leuthold, M. (2013, 2013). Seasonal forecasting and climate change projection of the American monsoon using a regional atmospheric model . 2013 American Geophysical Union Meeting of the Americas. Cancún, Mexico. Castro, C. L., Chang, H., & Leuthold, M. (2013, May). Assessing Climate Change Impacts for Military Installations in the Southwest United States During the Warm Season . 2013 American Geophysical Union Meeting of the Americas. Cancún, Mexico. Chang, H. I., Castro, C. L., & Niu, G. (2013, December). Impact of dynamic vegetation on evolution of the North American Monsoon region in a regional climate model. . 46th American Geophysical Union Fall Meeting. San Francisco, CA: American Geophysical Union. Chang, H., Castro, C. L., & Niu, G. (2013, December). Impact of dynamic vegetation on the evolution of the North American monsoon in a regional climate model . Fall Meeting of the American Geophysical Union. San Francisco, California. Chang, H., Castro, C. L., Troch, P., Switanek, M., Luong, T., & Dominguez, F. (2013, January). Dynamically Downscaled IPCC RCM Climate Projection for the Southwest and their Applicability in Hydrologic Resource Projection. . 93rd American Meteorological Society Meeting, 27th Conference on Hydrology. Austin, Texas. Luong, T., Castro, C. L., Luong, T., Castro, C. L., Nguyen, T., Nguyen, T., & Cassell, W. (2013, January). Improvement in the representation of warm season convective precipitation in complex terrain using a modified Kain-Fritsch convective parameterization scheme . 93rd American Meteorological Society Meeting,. Austin, Texas. Luong, T., Nguyen, T. M., Castro, C. L., Chang, H., & Carrillo, C. (2013, December). Improvement in the representation of the North American monsoon convective precipitation in a 20-year climate simulation using a modified Kain-Fritsch convective parameterization scheme . 2013 Fall Meeting of the American Geophysical Union. Chang, H. I., Castro, C. L., Dominguez, F., & Monson, R. K. (2012, December). The synergistic relationship of climate change and natural variability in consideration of dynamically downscaled warm season climate projections in North America . 45th American Geophysical Union Fall Meeting. San Francisco, CA: American Geophysical Union. Chang, H. I., Castro, C. L., Carillo, C., & Dominguez, F. (2011, December). Future regional climate assessment for the Southwest U.S. Summer monsoon region using dynamically downscaled IPCC scenarios . 44th American Geophysical Union Fall Meeting. San Francisco, CA: American Geophysical Union. Chang, H. I., Castro, C. L., Dominguez, F., & Ciancarelli, B. (2010, December). Potential Improvement in Warm Season North American Monsoon Forecast Using Dynamically Downscaled GCM Data . 43rd American Geophysical Union Fall Meeting, San Francisco. San Francisco: American Geophysical Union. Castro, C. L., Moker, Jr., J. M., Serra, Y., Arellano, A. F., & Adams, D. K. (2018, January). Convective-permitting hindcast simulations during the North American monsoon GPS Transect Experiment 2013: Establishing baseline model performance. . 98th Annual American Meteorological Society Meeting. Castro, C. L., Ochoa, C. A., & Quintanar, A. (2018, January 2018). Convective-Permitting Simulations of Extreme Weather and Climate Events in El Salvador with the Weather Research and Forecasting Model . 98th Annual American Meteorological Society Meeting. Dennis, R., Castro, C. L., & Chang, H. (2018, September). The Skill of Statistically Forecasting the Early Monsoon Onset in the Southwestern United States at a Subseasonal to Seasonal Timescale . International Conferences on Subseasonal to Decadal Prediction, National Center for Atmospheric Research. Sujan, P., Chang, H., Castro, C. L., & Dominguez, F. (2018, January). Towards Improvement in Seasonal Forecasting Using a Regional Climate Product at the Convective-Permitting Scale. . 98th Annual American Meteorological Society Meeting. Sujan, P., Chang, H., Castro, C. L., & Dominguez, F. (2018, September). Towards Improvement in Seasonal Forecasting Using a Regional Climate Product at the Convective-Permitting Scale. . International Conferences on Subseasonal to Decadal Prediction, National Center For Atmospheric Research. Castro, C. L., Chang, H. I., Castro, C. L., & Chang, H. I. (2017, Dec). North American monsoon hydroclimat eextremes in the Southwest U.S. influenced by dynamically downscaled CMIP5 ensembles . American Geophysical Union Annual Meeting. Castro, C. L., Chang, H. I., Luong, T., Carillo, C., Lahmers, T., Jares, M., & Mazon, J. (2017, January). Evaluating Changes in Extreme Weather During the North American Monsoon in the Southwest U.S. Using High Resolution, Convective-Permitting Regional Atmospheric Modeling . 97th American Meteorological Society Annual Meeting. Seattle, WA: American Meteorological Society. Chang, H. I., Castro, C. L., Megdal, S. B., & Tapia, E. (2017, January). Toward Improved Seasonal Forecasting of Water Resources and North American monsoon Precipitation in the Southwestern United States . 97th American Meteorological Society Annual Meeting. Seattle, WA: American Meteorological Society. Chang, H. I., Lorenzo, A. T., Castro, C. L., Betterton, E. A., Leuthold, M. S., Holmgren, W. F., & Cao, Y. (2017, January). An Evaluation of Nine ARW-WRF Microphysics Schemes for Solar Power Forecast in Arizona . 97th Annual Meeting of the American Meteorological Society. Seattle. Lahmers, T. M., Castro, C. L., Gupta, H. V., Gochis, D. J., Dugger, A. A., & Smith, M. (2017, January). Enhancing the NOAA National Water Center WRF-Hydro model architecture to improve representation of the Midwest and Southwest CONUS climate regions . 97th American Meteorological Society meeting, 31st Conference on Hydrology. Mazon, J., Adams, D. K., Carrillo, C. M., Jares, M., Lahmers, T., Luong, T. M., Castro, C. L., & Chang, H. I. (2017, Dec). The more extreme nature of North American monsoon precipitation in the Southwestern United States . Americal Geophysical Union Annual Meeting. Castro, C. L., Castro, C. L., Chang, H. I., Chang, H. I., Luong, T., Luong, T., Lahmers, T., Lahmers, T., Jares, M., Jares, M., Mezon, J., Mezon, J., Carrillo, C., Carrillo, C., Adams, D., & Adams, D. (2016, August). Evaluating Changes in Extreme Weather During the North American Monsoon in the Southwest U.S. Using High Resolution, Convective-Permitting Regional Atmospheric Modeling . GEWEX Convection-Permitting Climate Modeling Workshop. Boulder, CO: National Center for Atmospheric Research. Castro, C. L., Chang, H., Luong, T., Lahmers, T., Jares, M., Carrillo, C., Adams, D. K., & Mazon, J. (2016, September). Evaluating Changes in Extreme Weather During the North American Monsoon in the Southwest U.S. Using High Resolution, Convective-permitting Regional Atmospheric Modeling . GEWEX Convective-Permitting Climate Modeling Workshop. National Center for Atmospheric Research, Boulder, CO.
Luong, T. M., Castro, C. L., Ochoa, C. A., Quintanar, A., & Adams, D. K. (2016, December). Extreme Precipitation Events in the Valley of Mexico as Revealed by a Long-Term Climate Simulation (A13A-0211) . 2016 American Geophysical Union Fall Meeting. San Francisco, CA. Castro, C. L., Chang, H., Luong, T., Jares, M., Mazon, J., Carrillo, C., & Adams, D. K. (2015, December). Evaluating Changes in Extreme Weather During the North American Monsoon in the Southwest U.S. Using High Resolution, Convective Permitting Regional Atmospheric Modeling . American Geophysical Union Fall Meeting. San Francisco, California. Castro, C. L., Lahmers, T., Serra, Y., Brost, J., Luong, T., & Adams, D. K. (2015, December). Assessment of Long-Term Trends in Transient Inverted Troughs within the North American monsoon region: Mechanisms and Implications for Warm season precipitation . American Geophysical Union Fall Meeting. San Francisco, California. Castro, C. L., Luong, T., Chang, H., Lahmers, T., Carrillo, C., Jares, M., & Adams, D. K. (2015, December 2015). Evaluating Changes in Extreme Weather During the North American Monsoon in the Southwest U.S. Using High Resolution, Convective Permitting Modeling . American Geophysical Union, Fall 2015 Meeting. Chang, H. I., Castro, C. L., Castro, C. L., & Chang, H. I. (2017, Dec). North American monsoon hydroclimat eextremes in the Southwest U.S. influenced by dynamically downscaled CMIP5 ensembles . American Geophysical Union Annual Meeting. Castro, C. L., Chang, H., Lahmers, T., Carrillo, C., Luong, T., Jares, M., Stutler, J., Mazon, J., & Leuthold, M. (2014, January). Assessing climate change impacts for DoD installations in the Southwest United States during the warm season: Progress toward characterizing the historical record . 26th Conference on Climate Variability and Change, 94th American Meteorological Society Meeting. Atlanta, Georgia. Castro, C. L., Chang, H., Luong, T., Lahmers, T., Jares, M., & Carrillo, C. (2014, December). Projecting Future Change in Extreme Weather During the North American Monsoon in the Southwest Using High Resolution, Convective-Permitting Regional Atmospheric Modeling . American Geophysical Union Fall Meeting. San Francisco, California. Chang, H. I., Troch, P. A., Castro, C. L., & Mukherjee, R. (2014, June). Regional climate and streamflow projections in North America under IPCC CMIP5 scenarios . 3rd Lund Regional-scale Climate Modeling Workshop. Lund, Sweden: Lund University. Chang, H., Castro, C. L., Troch, P., & Mukherjee, R. (2014, December). Regional climate and streamflow projections in North America under IPCC CMIP5 scenarios . American Geophysical Union Annual Meeting. San Francisco, California. Jares, M., Castro, C. L., Chang, H., Carrillo, C., Mazon, J., Stutler, J., & Brost, J. (2014, January). High Resolution WRF Simulation and Climatological Analysis of Severe Weather Events During the North American Monsoon . 26th Conference on Weather Analysis and Forecasting, 22nd Conference on Numerical Weather Prediction, 94th Annual American Meteorological Society Meeting. Atlanta, Georgia. Castro, C. L., Chang, H., & Leuthold, M. (2013, January). Assessing Climate Change Impacts for Military Installations in the Southwest United States During the Warm Season . 93rd American Meteorological Society Meeting, 27th Conference on Hydrology. Austin, Texas. Mazon, J., Castro, C. L., Chang, H., Leuthold, M., & Brost, J. (2013, Januay). Objective Climatological Analysis of Warm Season Extreme Events During the North American monsoon . 93rd American Meteorological Society Meeting, Symposium on the Role of Statistical Methods in Weather and Cliamte Projection. Stutler, J., Castro, C. L., Brost, J., & Chang, H. (2013, January). Determining Gulf Surge Contributions to NAM Precipitation Using Observational and Reanalysis Data. . 93rd Annual American Meteorological Society Meeting, 25th Conference on Climate Variability and Change. Austin, Texas. Chang, H. I., Carrillo, C., Demaria, E., Dominguez, F., Castro, C. L., & Durcik, M. (2011, May). Dynamical downscaling of global climate model products for water resource projection in the Southwest U.S . Sustainability on the Border: Water, Climate and Social Change in a Fragile Landscape. El Paso, TX: University of Texas, El Paso. Chang, H. I., Castro, C. L., & Ciancarelli, B. (2010, December). Statistical Analysis and Verification of Dynamically Downscaled Seasonal Forecast for the Summer North American Monsoon Region . 43rd American Geophysical Union Fall Meeting. San Francisco, CA: American Geophysical Union. Part of NA CORDEX data archive: Dynamically downscaled CMIP5 regional climate data using WRF regional climate model. Two sets of CMIP5 products are downscaled (MPI ECHAM6 and HadGEM2) at 25 and 50km resolution for 1950-2100. ERA-Interim Reanalysis is also downscaled at 25 and 50 km resolution for 1979-2016, it is used as CMIP5 downscaled product validation baseline. Castro, C. L. (2017, May). Assessing climate change impacts for DoD installations in the southwest United States during the warm season. Strategic Environmental Research and Development Program, Final Rep. RC-2205. www.serdp-estcp.org/Program-Areas/Resource-Conservation-and-Resliency/Infrastructure-Resiliency/Vulnerability-and-Impact-Assessment/RC-2205. Kotamarthi, R., Mearns, L., Hayhoe, K., Castro, C. L., & Wuebbles, D. (2016, July). Use of Climate Information for Decision Making and Impacts Research: State of Our Understanding. Strategic Environmental Research and Development Program (SERDP) Project RC-2242, Technical Report. Jones, R., McGregor, J., Castro, C. L., & Smith, J. (2015, February). Climate Change and Impact Modeling Experts' Report, TA-8090: Building Capacity for Climate Resilience, Climate Modeling Advisory Group. Prepared for the Government of Tajikistan and the Asian Development Bank.